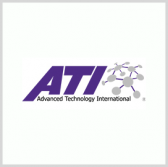 Advanced Technology International has issued a request for enhanced whitepapers regarding a consortium aiming to develop aviation and missile technologies for the U.S. military. The Aviation and Missile Technology Consortium consists of national armaments and vertical lift groups partnered with the U.S. Army on an effort to boost the combat performance of warfighters, the Department of the Army said Thursday in a FedBizOpps notice. Responses to the request may result in contract awards for the development of prototypes. ATI will accept white paper entries exclusively from AMTC members through Nov. 27. Interested members may look at the AMTC website for guidelines on submitting responses.